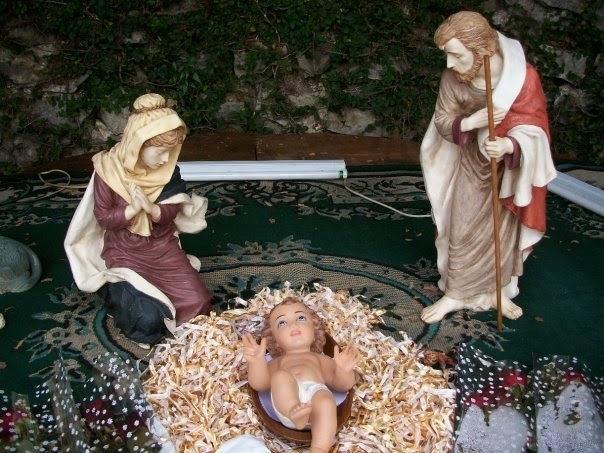 One of the most iconic Catholic traditions of Christmas is the Christmas crèche. Here, we are invited to contemplate the various figurines contained within the scene; with the members of the Holy Family at its very heart and centre. And so we see the humble figures of Mary and Joseph kneeling before the manger gazing lovingly upon their newborn son, the Son of Man, the Son of God. In a way, the whole scene reaffirms a wonderful truth – it reminds us of God’s immense trust for this couple, that He would deigned it fitting to entrust his only Son to two human beings, a woman and a man, wife and husband. Joseph and Mary were far from the perfect and ideal couple, by modern standards. The beginnings of their married and family life were already marked by disastrous omens – a suggestion of conception out of wedlock, the threat of divorce, dislocation and homelessness, economic poverty and to top it all - a hostile environment that posed the greatest threat to both the safety and welfare of the couple and their new born child. In today’s world, all these would be interpreted as unfavourable factors that would warrant either delaying the marriage, postponing the start of a family, or even justify the abortion of the foetus within the womb. But something amazing took place. Instead of turning their backs on each other and on the child, Mary’s fiat and Joseph’s acceptance of the Incarnation – indeed the man and woman’s loving obedience to God’s will triumphed at the end. Their love for God, which outweighed self-interests and societal pressures, served as the wellspring for their own steadfast love and provided a rich sanctuary for the Christ Child. Thus, this figures assembled in the Nativity scene, call us back not only to the mystery of the Incarnation, to the joyous event of Christmas, but to the very origins of creation itself. We come to recognise that the crown of God’s creation after he set in place all fixtures and wonders of the universe is not just man alone, but a man, both male and female, made in the image of God, and entrusted with the first commandment to come together in marriage and to form a family. What does it mean, though, that man as male and female has been created in the image and likeness of God? This simple verse in the Bible affirms that both male and female, while fully equal as the image of God, are nonetheless distinct in the manner of their possession of the image of God. This is what we call the complementarity of man and woman. Therefore family itself becomes a sign that points to the very wellspring of love, the Holy Trinity – One God in Three Persons. The family is an icon of the Most Holy Trinity. In October of this year, the world’s attention was caught by the proceedings and statements emerging from the Extraordinary General Assembly of the Synod of Bishops on Family and Marriage. The media focus may be due to the fact that hot-button issues came to the fore, suggesting perhaps that the Catholic Church was on the verge of making major changes to its doctrinal teachings, especially in the areas of divorce and homosexuality. Why so much interest in the press? It has much to do with contemporary culture. Contemporary culture is challenging the most vital aspects of the existence of the human being, in ways that go so far as to overturn our understanding of human nature, and particularly of human sexual identity and relations between the sexes. Contemporary culture is proposing and imposing models for sexual identity and relations between the sexes that would ultimately mean redefining marriage and the family. Contemporary culture cannot accept that man is made in the image and likeness of God. Contemporary culture has no place for God and his kind. In contrast to the Synod, very little media attention was given to a subsequent Conference organised by the Vatican in November expounding on the complementarity of men and women in marriage. There was nothing sensational when speaking of traditional family values. And with the mainstream media avoiding the topic, the rest of the Catholic world, which often relies on secular media than on its own institutional channels for information, were left clueless about what transpired. The Blessed Virgin Mary and St Joseph, the woman and man who wait before the manger in our homes and in our churches, affirm the beauty of this daily path of married love — this school of virtue — and they testify against “the culture of the temporary,” which, said the Pope, has wreaked the most havoc in poor communities. Therefore, the feast we celebrate today is so important to reaffirm once again the beautiful original plan of God at creation, a plan that is not subject to the fleeting changes of fad and fashion, precisely because God had “forged the covenant of marriage as a sweet yoke of harmony and an unbreakable bond of peace”. In the nuptial blessings contained in the Wedding liturgy, we are comforted by the promise that the blessings endowed by God on marriage and family life is “not forfeited by original sin nor washed away by the flood.” May the Nativity figures of the Blessed Virgin Mary, St Joseph and the Christ Child inspire us to foster and embrace the distinctive gifts we share in our marriages and spur us to help others, especially families in crisis, see their own salvation in the steadfast love of the Holy Family.